The Metropolitan Transit Authority of Harris County (METRO) is the region’s largest public transit provider, offering safe, reliable and affordable transportation services about 370,000 times per day. Besides operating more than 1,200 buses on METRO’s network, METRORail's system includes the Red Line (Main Street and Northline), Green Line (East End) and Purple Line (Southeast). METRO’s services also include: STAR Vanpool, METROLift, HOV/HOT lanes, Bike & Ride program, Park & Ride, and road improvement projects. Learn more about METRO services at ridemetro.org where you will also find useful tools like the RideMETRO app where you can plan your trip and even pay your fare from your phone. Give those running shoes a break. 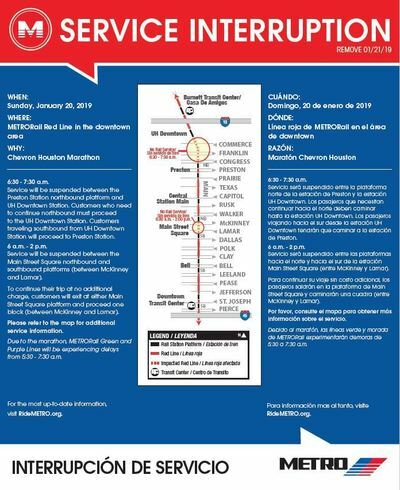 On Sunday, Jan. 20, 2019, rides on METRORail will be FREE for both half and full marathon participants wearing an official race bib. 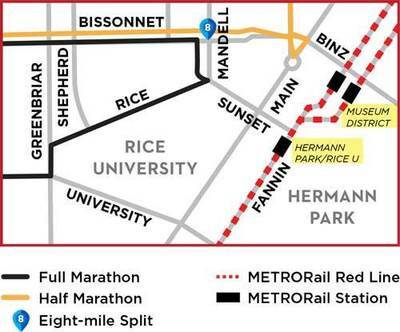 METRORail's Museum District Station and Hermann Park/Rice U Station offer close proximity to the marathon route while Convention District Station is located just blocks from the finish line near the George R. Brown Convention Center. METRO is also the easiest way for spectators and supporters to catch runners at half-way points. Tickets are $1.25 and you can transfer for up to three hours at no additional charge. In addition to using a METRO Q Fare card, riders can purchase tickets via smartphone with METRO's Q Mobile Ticketing app or from ticket vending machines located on METRORail platforms. To make way for the event, METRO will implement bus detours along the race route beginning at midnight on Thursday, Jan. 17. For a complete list of detours and affected transit routes click here. On Sunday, Jan. 20, rail service will also be suspended between Preston Station northbound platform and UH Downtown Station from 6:30 - 7:30 a.m. and at both Main Street Square Station platforms from 6 a.m. - 2 p.m.
For more information, please call METRO Customer Service at 713-635-4000. Click map for more information. Please do not reply to this message. We are unable to respond to inquiries sent to this email account. Contact the METRO Press Office at 713-739-4040. This service is provided to you at no charge by Metro Transit Authority of Harris County.